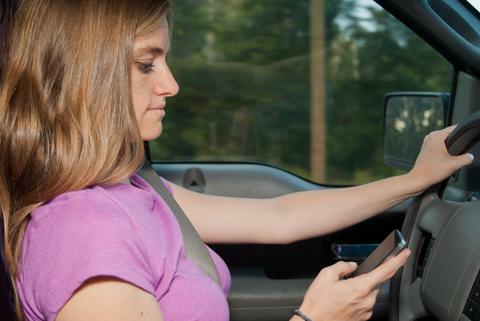 Cell phones + teen drivers = danger? These days, teens always have their cell phones on hand. However, lawmakers want to make sure that the phones stay off when teens are driving. California passed a law in September prohibiting anyone under age 18 from using a cell phone while driving. Adults, however, may use hands-free devices while behind the wheel. Altogether, 17 states and the District of Columbia have banned or restricted teen drivers’ cell phone use. Some lawmakers say that limiting phone usage will save teen lives. In 2005, the latest year for which data is available, 5,699 teens ages 16 to 20 died in car crashes. Drivers from 16 to 20 accounted for 27.4 percent of all fatal crashes, but they represented less than 7 percent of all drivers. Opponents of the new laws, however, say that the cell phone restriction should extend to all drivers, not just teens. Two of CE’s student reporters took on this debate. Ky Sisson of Nevada takes the pro-ban stance, and Kayla Hill of Kentucky reports on why the law shouldn’t single out teens. If teens are either talking or texting on their cell phones while driving, it’s a distraction. A 2002 study by the Ford Motor Company found teen drivers are more likely to be distracted by cell phones than adults are. Dialing a cellphone resulted in teens’ crossing lane lines 53.8 percent more often than when not using the phone, according to the study. That’s why California Gov. Arnold Schwarzenegger signed the recent ban. “The simple fact is that teenage drivers are more easily distracted,” Schwarzenegger said. Although the ban is meant to ensure the safety of young drivers, it is a prime example of stereotyping teenagers. Teens have the right to drive, so they should receive the same privileges that all drivers have. Teens should not be singled out when it comes to unsafe driving with the use of cell phones because all drivers can be careless behind the wheel, no matter how old they are. Ask students: Do you have a cell phone? If so, do you text message? Can you concentrate on other things while having a conversation or text messaging? In 2006, more than 400,000 passengers ages 15 to 19 were injured in motor vehicle crashes. Teenage male drivers are one and a half times more likely to die in car crashes than teenage female drivers, according to the Centers for Disease Control and Prevention. A 2002 Ford Motor Company study found that teen drivers tend to follow other cars at closer distances and have less control of their vehicles than more experienced drivers. The study concluded that teens should be discouraged from using cell phones while driving because of the level of distraction the devices cause. The study included 48 adults ages 35 to 66 and 15 teenagers. In 2006, there were 233 million cell phone subscribers in the United States, according to the Cellular Telecommunications & Internet Association. That’s 76 percent of U.S. households. Have students use the Internet to research teen driving and cell phone restrictions in your state. Does your state have a law restricting or banning cell phone use by teen drivers? Have students use their research to write essays explaining why they think their state’s law is good or bad. « Cell phone hang-up: should there be an all-out ban on cell phone use while driving? 1Pingbacks & Trackbacks on Cell phones + teen drivers = danger?